Cleaning Every Nook & Cranny! Be it at your restaurant or home, we’ll get your kitchen exhaust hood sparkly clean by the end of the day! Some home kitchens, but mostly industrial kitchens are equipped with exhaust systems, whose main purpose is to convey burnt gases from the ovens and open flame stoves and guide them out of the structure. As part of the exhaust system's operation it accumulates grease in the hood, ducts, fans and vents, which eventually turns into a fire hazard. Therefore, its cleaning is essential and the guidelines to doing so are specified in the National Fire Protection Association's (NFPA) professional information. What is Hood Cleaning Service? Since accumulated grease and fat are not just unsightly or release an unpleasant odor, but actually pose a serious fire hazard, they must be removed. This service entails the process of removing the accumulated grease in the exhaust system in industrial kitchens as well as in private homes. In order to ensure the safety of your kitchen, employees and customers, it is important to hire professionals for this service, so you can be sure they follow the local, county and state fire regulations. Removing the grease is usually done by scraping the surface clean, applying caustic chemicals, and washing it all with hot water and high-pressure water combined with professional detergents. How Often does the Exhaust System have to be Cleaned? Deciding how often the exhaust system has to be cleaned depends on the frequency and intensity of its use. After each use (meaning before closing time) the system should be checked to see how much grease has accumulated and accordingly a decision has to be made regarding the time for a clean-up. Some food related business owners prefer to set regular time intervals in which the exhaust system is cleaned, for example once a week or once a month. However, we believe it is more recommended to examine the system and get a more accurate picture of its condition, since sometimes there are slower days or weeks and sometimes it's busier. So, it is important to keep track of the best time to clean it. At Duct & Attic Cleaning Experts, Huston, we offer professional kitchen exhaust hood cleaning for your industrial or private kitchen. Our company has substantial experience and our team will provide you with great customer service. Each service is provided at the highest level to our customers' full satisfaction. Additionally, we maintain a competitive pricing policy, so call us today and use our experts of cleaning! Commercial kitchen exhaust cleaning is mandatory by law in many places, and often a specific schedule is required, depending on the workload. Monthly cleaning for establishments with solid fuel cooking; a quarterly schedule for commercial kitchens that prepare high volumes of food, and a semi-annual schedule for restaurants with a sit-down environment. Organizations that only cook small volumes or are required to stick to an annual schedule. Replacing the filters and wiping the range hood itself are relatively simple tasks. However, cleaning the vent that leads from the hood to the outside of the building should definitely be done by a professional. There are no specific legal requirements for residential kitchen hoods, but logic should dictate the frequency in this case. Regular degreasing and washing of the air filter and cleaning the range hood itself with a degreasing spray can be very beneficial. 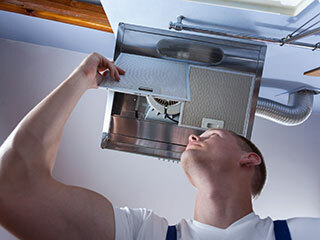 However, remember that the vent and the fan should only be handled by a professional. What are some kitchen hood design options? Exhaust hoods are becoming an architectural design feature of many kitchens. They can be bought off the rack or specially made to be incorporated into the cabinetry and match the style and the color of the wood. In addition to traditional vented hoods, low profile mounted and ductless models, there are now downdraft ventilation systems that are built as part of the cooktop and can retract into the counter, leaving a flat surface when not in use. There are also exhaust hoods that look like lamps and made of stainless steel or glass with embedded LED lights. Another option is a flush mounted hood for a smaller kitchen, or a modern sleek wall mounted unit that can even become the focal point of the kitchen due to its unusual design.